Everybody should blog. Blogging is now a basic tool to succeed in almost every field. Here are 10 reasons why. You should be blogging, whether you run a business, freelance part time or hope someday to land that dream job. Hairdresser? Plumber? Home inspector? Nuclear safety monitor? Whoever you are, other than a criminal or a spy, blogging gets you ahead. Most of these 10 reasons apply to you. Let’s face it, you have something to say. Everybody does. A blog gives you an outlet to let loose and say what’s on your mind. True, you do have to be careful. Not everything on your mind is meant to be shared. But much of what you think about can be very useful to show your value to potential clients and employers. There is nothing that says “this is an expert” like a blog. Well, almost nothing. A book still does a better job labeling you an expert. But a blog is quicker and less expensive. Whereas a book is ideal for consultants, coaches and anybody with high-priced services to offer, it is less useful for people selling lower-priced services. Unlike writing a book, blogging is for everybody (except undercover spies and drug smugglers). Blogging is the ultimate networking tool. How so? You start the conversation. You explain in great detail your own thoughts and predictions. Then it’s someone else’s turn. They leave a comment, and you can respond. The more thought-provoking your blog post, the more interesting the comments are likely to be. This is most important for a business, but can also be useful for a job-seeker. The more content you have and the better your content is, the more likely that your name will come up tops in a search. This is particularly important if you have a common name, although it is useless for somebody like me who has to compete with a famous namesake (imposter!). Chances are these days that you are on social media. So what do you post? Pictures of that spaghetti dinner? Lolcats? Memes? Those can be fun, but they won’t get you anywhere. If you want more leads and potential job offers, you’ll need to feed your social media accounts with things that show potential clients and employers how valuable you are to them. A resume can say only so much. It summarizes. The French word “résumé” means “summary”. But a resume doesn’t give much detail. It gives you no room to show off. That amazing job you did in landing a contract or in shaving 15 percent off the cost of a project? It’s hard to really explain that in one line. You can impress much better by explaining what you did, how you did it and how your thought process worked (which is always the most impressive part). What use is a business card? It has your name, your phone number and where to send you birthday gifts. It says nothing about you or your capabilities. That’s what blogs are for! Instead of giving a tiny piece of cardboard, send them a link to your blog. If they like what they read, at least they won’t throw it out like a business card. A resume can claim just about anything. Dates and titles can be verified, and often they are, but that’s not really the important stuff. With a blog, a potential client or employer can see what you really know. They can see just how deep your knowledge goes and how insightful you are with that knowledge. It’s tangible proof that you are worth hiring. Think about your target audience. Who would hire you, and what information would they be looking for on the Internet? That’s what you should blog about. By the time that client or employer needs new talent, after reading dozens of your blog posts, whom do you think they’ll want to hire? Psst. If you need someone to write your blog posts or to write your book, we can help! For me blogging is also a way to systematize my knowledge and thoughts in general. It also teaches self-discipline. Blogging gets my thoughts shared. Just started several months ago. Has been mostly positive. Also get to exchange ideas with others. 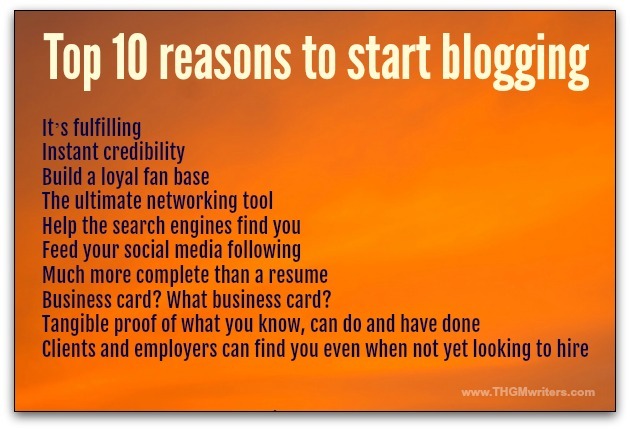 I agree with all your ten reasons to blog. Out of the ten, the first one is what I love the most. It feels good to share my knowledge with the world and have people see value in it. This can be gauged by the positive comments, emails I receive to the recommendations and sharing of my content. Thanks very much for sharing this insightful article. I agree with you that blogging is indeed giving an instant credibility. Furthermore, it’s presenting the author as an expert in his niche. A blog has huge potential for making leads. And I’ve personally experienced it myself with my blog. Most companies nowadays consider blogging seriously. I’ve been blogging for a while now. And I found it myself an awesome way to increase awareness around who Iam and what I do. Alongside with all that, it really feels incredible to share knowledge with everyone. I love #7. It’s indeed much more complete than just a resume. Well said! Thanks again for sharing and please keep up the great work!